The Green turtle is listed as vulnerable. It has a small head and a dark green-brown carapace. It is a food source for Aboriginals and Torres Strait Islanders. Unlike most sea turtles, adult green turtles are herbivorous, feeding on sea grasses and algae living in inshore bays, lagoons and shoals with lush seagrass meadows. Juvenile green turtles, however, will also eat invertebrates like crabs, jellyfish, and sponges. Green sea turtles migrate long distances between feeding sites and nesting sites; some swim more than 2,600 kilometres to reach their spawning grounds. Females usually mate every two to four years. Their common name derives from the usually green fat found beneath their carapace. The carapace (shell) can be yellowishor olive-green but it can also be brown to brownish-black. The scutes (the plates on the shell) are also usually variegated with streaks of brown, reddishbrown or black. The hatchlings are a shiny black with white edges to their flippers, and white underparts. A newly hatched green turtle is usually less than 5 centimetres long and weighs less than 25 grams. Size & Weight: Adults are between 83 and 114 cm in carapace length and weigh between 110 - 190 kg. The largest known weighed 395 kilograms. Diet: This changes significantly during its life. When less than 20 to 25 cm in length they eat worms, young crustaceans, aquatic insects, grasses and algae. 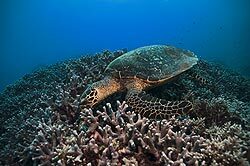 Once green turtles reach 20 to 25 cm in length, they mostly eat sea grass and algae, the only sea turtle that is strictly herbivorous as an adult. Their jaws are finely serrated which aids them in tearing vegetation. Habitat & Distribution: Mainly stay near the coastline and around islands and live in bays and protected shores, especially in areas with seagrass beds. Rarely are they observed in the open ocean. Found in all temperate and tropical waters throughout the world. 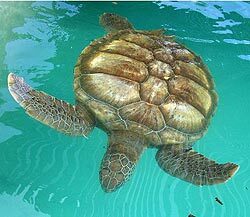 The green sea turtle's body is wonderfully adapted to life in the ocean. They swim gracefully around the globe using their flipper limbs and light, streamlined shells. While they breathe air, they can actually hold their breath for over 2 hours underwater and their eyes shed excess salt while their physiology maintains blood oxygen balance.